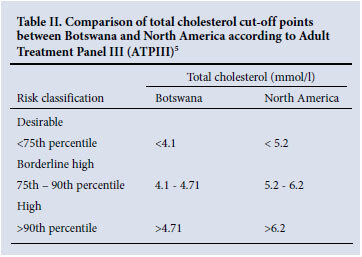 Reference intervals of total cholesterol, HDL cholesterol and non- HDL cholesterol concentrations were determined on 309 blood donors from an urban and peri-urban population of Botswana. Using non-parametric methods to establish 2.5th and 97.5th percentiles of the distribution, the intervals were: total cholesterol 2.16 - 5.52 mmol/l; non-HDL cholesterol 1.22 - 4.48 mmol/l; and HDL cholesterol 0.67 - 1.65 mmol/l and 0.59 - 1.59 mmol/l for females and males, respectively. Population-specific reference intervals when combined with other clinical data are important for clinical decision-making in the management of patients considered to be at risk for atherosclerotic cardiovascular disease (CVD). Reference intervals vary according to gender, age, ethnicity and diet, among other factors; it is therefore recommended that population-specific reference intervals be established. The ISO 15189:2003 standard recommends that biological reference intervals appropriate for the reference population and patient population be used when reporting laboratory results.1 Southern Africa has little study of populations that are undergoing significant change in lifestyle and risk of CVD. To our knowledge, there are no published reference ranges for clinical chemistry parameters for the Batswana adult population, and the common practice is to adopt reference intervals from other populations. 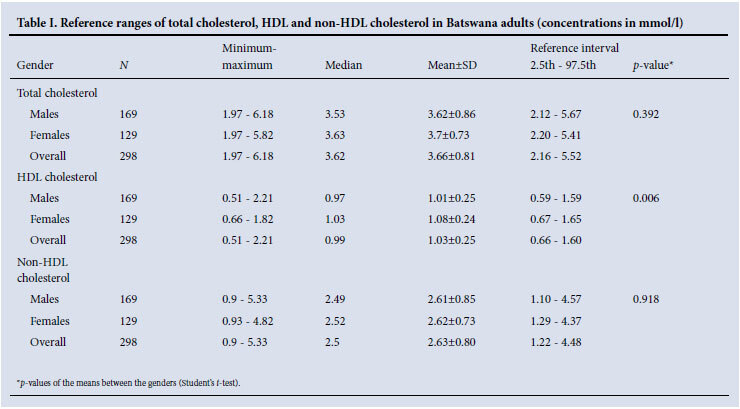 We aimed to establish reference intervals for serum total cholesterol, HDL cholesterol and non-HDL cholesterol concentrations in Batswana adults. Blood collected in plain tubes was transported chilled in a cooler box from NBTS to a central testing laboratory where it was centrifuged using a Haereus Instruments Biofuge primo centrifuge at 3 000 rpm for 5 minutes. Serum was separated and stored at -20ºC until analysis. The samples were tested using Roche reagent kits for total cholesterol and HDL cholesterol on a COBAS Integra 400 plus auto-analyser using enzymatic methods according to standard operating procedures. The analyser was calibrated using Roche calibrators, and quality control sera from the manufacturer were tested alongside the serum samples. Non-HDL cholesterol was obtained by subtracting HDL cholesterol from total cholesterol.3 The reference interval was calculated as the range between the 2.5th and 97.5th percentile values of the population using Stata/SE version 8.2 statistical software (StataCorp, Texas). Comparison between females and males was done using Student's t-test. In combination with other predisposing factors, HDL cholesterol concentration is useful in assessing the risk of developing coronary heart disease (CHD). Low levels of HDL cholesterol are associated with increased risk of developing CHD whereas a high concentration is protective against CHD. Non-HDL cholesterol correlates with mortality owing to CHD.7 To screen subjects at risk of developing CHD by using lipid concentrations, population-specific reference values should be applied. Table II shows that the total cholesterol concentration thresholds for CHD risk stratification are lower in the studied population, compared with North America. The samples in this study were from non-fasting donors. Previous studies recommend that lipid concentration estimations should be done on fasting specimens. However, recent literature suggests that fasting is not necessary for lipid concentration estimation and does not influence the results.4 In this study, we recognise that health status of the population was not determined by a physician; however, blood donors are considered a good source of reference individuals. Our findings, based on a limited sample size, suggest that reference intervals of lipids are lower in Batswana than other populations. As developing countries are expected to have CVD as the leading cause of death by 2020, a larger study in Botswana and possibly other regions of Africa to correlate vascular disease with the concentrations of the conventional lipid profile should be carried out. We thank the management and staff of the National Blood Transfusion Services Botswana for screening of blood donors and collection of blood samples, and the Department of Chemical Pathology, Princess Marina Hospital, Gaborone, for use of the chemistry auto-analyser and other equipment.